Ocean View was established in October, 1988, by Jim Bridges and Al Raymondi. The initial focus was short term furnished condominium vacation rentals. In 1990, Condominium Association Management was added as Ocean View began contracting for management and bookkeeping services for Ormond By The Sea Condominiums. In 1991 Real Estate sales became a natural adjunct to other services being offered. Ocean View has been in the same location since 1991 when it joined the Daytona Beach Area Association of Realtors. In 2002 We registered the trade name Ocean View Realty Group with the Florida Real Estate Commission to better reflect the full service nature of our residential Real Estate activities. Ocean View participates in the Daytona Beach area multiple listing service. We specialize in Ormond Beach and Ormond by the Sea. Ormond by the Sea is a small beachside community just north of Daytona Beach. Ocean View Realty Group specializes in Ormond By The Sea Florida. We are in the greater Daytona Beach area outside the city limits of Ormond Beach. Sales and rentals of residential Ormond Beach real estate including homes and condos in Ormond By The Sea Florida. Ocean View also has storage space for rent in Ormond By The Sea. Ocean View knows condominiums! Condominiums are our principal business. Through our vacation rentals, annual leases, sales, and management activities we have become condominium specialists. We currently work with investors who purchase older area homes for re-hab and re-sale. We also work with people re-locating to the area looking to purchase or lease. Our rental programs are second to none in the area. 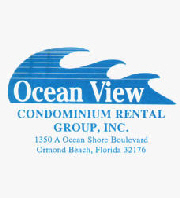 Ocean View is a small, independent company serving the Ormond by the Sea, Sales & Rental Real Estate market. Our Agents, Staff & Management Personel are knowledgeable full time professionals. Integrity, hard work and experience are enormous factors in our service oriented daily activities. If you are looking to buy, sell, or rent in quiet Ormond by the Sea, Ocean View Realty Group has well designed programs and efficient personnel who help you every step of the way. We help relieve some of the stress normally associated with buying,selling and renting. Ocean View is licensed and qualified to handle: SALES - Ocean View has homes, building lots and condominiums for sale through the Daytona Beach Area MLS. To view the available MLS properties for sale use the search properties selection at the left. RENTALS - Ocean View has many furnished condominiums and homes for rent weekly, monthly and seasonally. Our professionally cleaned units are equipped with everything you need-pots, pans, dishes, linens, etc. just bring your toothbrush! To look at rates and rules for our furnished rentals select "Rental inventory" at the upper left of this page or click on the Condo rental info link on the left. LEASES - If you are relocating to the area permanently or temporarily Ocean View offers leases of furnished and unfurnished homes and condominiums for 7 months to one year. For a sample of available properties select "Rental Inventory" at the upper left of this page or the Ocean View web page link and click on annual leases. Check us out at www.ovrealty.com At Ocean View one call does it all!! We do all we can to match buyer and seller needs for sales and rentals. We provide the highest level of service possible. Ideal location, convenient to all Central Florida attractions. Spend peacefull evenings in quiet Ormond by the Sea. Comfortable accommodations with private balcony overlooking the Atlantic Ocean. Attractive, professionally cleaned fully furnished and equipped condominiums and homes available for rentals of a week or longer starting at $500.00 per week. If you are thinking of buying, selling, or renting Ormond By The Sea real estate contact Ocean View today. This page has been visited 12,586 times.